Online Bonus Content from the July 2012 issue. At first glance, Don DeLoach’s new E-36 electric Free Flight design, the Super Pearl 202-E, recalls the small Free Flight power models of the past: constant-chord wing planform, high pylon, and all-balsa wing and tail construction. But it is not a rehash of some 40-year-old plans. Designed specifically for the new E-36 rules that went into effect in 2011, the model combines proven construction techniques with some new twists. What is E-36? Like the popular P-30 Rubber event, E-36 was developed to provide a high level of performance with a minimum investment in building time or financial outlay. The new rules allow any type of electric motor and either a two-cell lithium battery or a six-cell nickel battery. Gearing and folding propellers are permitted, but auto surfaces are not. Minimum weight is 120 grams (roughly 4-1/2 ounces). As with P-30, the flight maximum is two minutes, making it a good small-field event. For the first three flights, the motor run is limited to 15 seconds. If the first three flights are maxes, then the fourth flight motor run is limited to 10 seconds. If that one is maxed, then the motor run for the fifth and any subsequent flights is cut to 5 seconds. Limiting the wingspan to 36 inches eliminates the need for carbon-fiber D-boxes and other advanced construction techniques needed with the high-aspect-ratio wings found in events that limit wing area instead of wingspan. 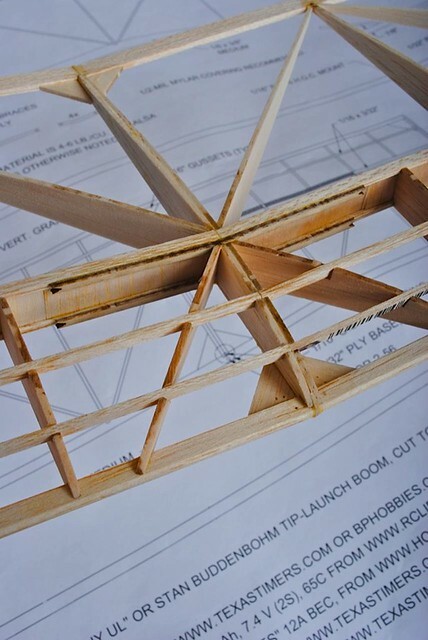 A traditional balsa structure will work fine. The typical E-36 design features a wing chord of 5-½ to 6 inches and an overall length of roughly 30 inches. The flat-bottomed wing airfoils are typically thick, allowing quick construction and sufficient stiffness. Since no auto surfaces (such as an auto stabilizer or auto rudder) are allowed, E-36 models follow traditional gas model trim: a spiral climb to the right controlled by left thrust and washin on the right main wing; glide is usually to the right, determined by stabilizer tilt. Although Don designed the Super Pearl 202-E late last summer, it has already racked an impressive contest record. Don and Dan Berry finished first and second at the Southwest Regionals in Eloy, Arizona and Don and Randy Reynolds placed first and second at the Isaacson Winter Classic in Lost Hills, California. You can order the Super Pearl 202-E directly from Don. It is available as plans only or the plans and a short kit of laser-cut ribs and other parts. 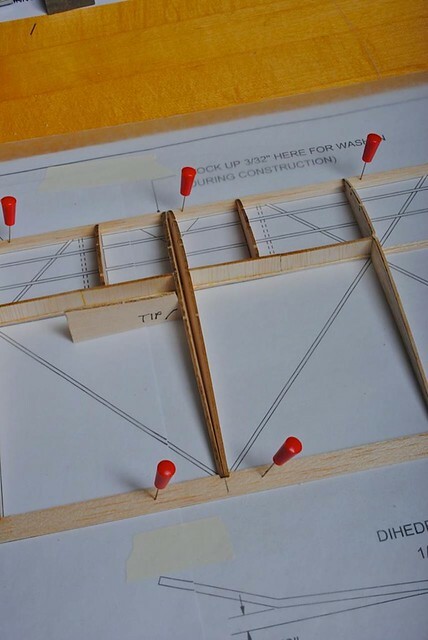 As with any short kit, you provide the strip wood, sheet balsa for pylon sides and rudder, covering, and hardware. 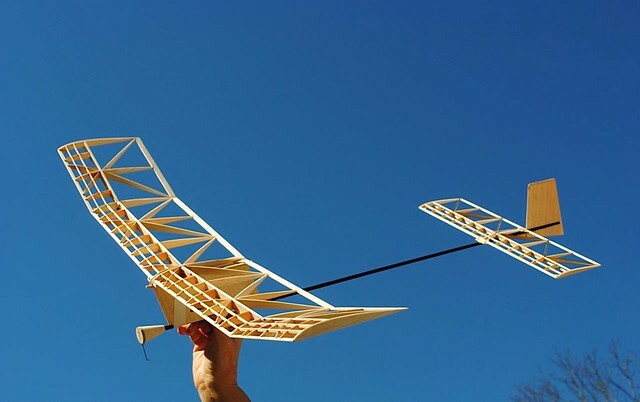 Strip wood and balsa sheet are available at your local hobby shop, but you will need to order is the carbon-fiber kite spar used for the fuselage. Two are suggested on the plans: the AVIA G-Force Skinny UL, available from online kite suppliers such as Goodwinds, and Stan Buddenbohm’s tip-launch glider boom, available directly from Stan. However any 32 inch or longer tapered carbon fiber kite spar would work if it is in the 7-gram weight range. Expect to pay roughly $12 plus shipping. You will also need to order the motor, propeller, and additional electronic equipment needed for electric-powered FF. See the “Electrification” box for more information. The plans come as a single rolled sheet measuring 24 x 40 inches. The CAD-drawn plans are accurate and include full-size drawings of all the ribs. You could scratch-build the model from the plans, but having laser-cut parts is easier. An advantage of CAD-drawn plans is that they can easily be updated. I noticed a few minor changes between the plans dated August 2011 shown in my February 2012 “FF Duration” column and the updated plans I received in January 2012. 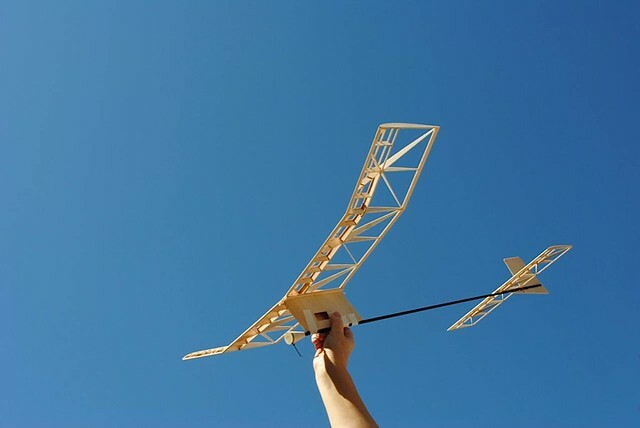 The short kit includes three sheets of 1/16-inch balsa containing the wing and stabilizer ribs, triangular gussets, and vertical webbing for the wing and stabilizer main spars. A small sheet of 1/16-inch plywood includes stabilizer mount, two discs for the motor mount, and dihedral braces. The laser cutting for both balsa and plywood was clean and accurate; the balsa parts came out easily with only an occasional need for the knife, but it took a little work to cut through the small sections connecting the plywood pieces to the sheet. 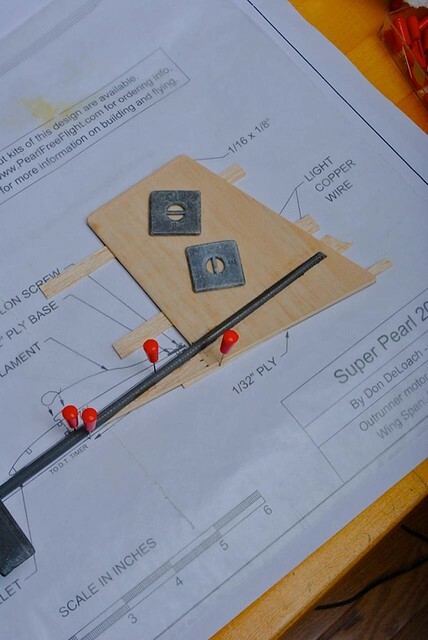 Building the Super Pearl 202-E should not be a problem for anyone with stick-and-tissue experience. As with any kit, it is a good idea to spend time studying the plans before you grab the glue. Try to think through the steps for constructing each component and make sure you have the necessary wood and tools. You will need to make a special tool to notch the TE for the stabilizer and wing ribs. I found a flat, 1/16-inch thick needle file and temporarily attached a short piece of 1/8-square basswood on each side, 1/16 inch back from the edge. If you don’t have a file, substitute a piece of 1/16 plywood with a 1/16-inch wide piece of medium sandpaper glued to the edge. The 4 x 15 inch stabilizer utilizes multispar construction and a 7% flat-bottom airfoil. Diagonal ribs running from the main spar to the TE add torsional strength. I began construction by carefully marking the rib locations on the piece of 1/16 x 3/16-inch balsa, then using the notching tool to make notches. Take note that the center notch is 1/8-inch wide to fit the double center rib. This is glued up from two of the 1/16-inch straight ribs. Before gluing together, I filed a wide, shallow notch in the side of each rib to create the pocket for the 1/16 plywood hook that will be installed after covering. Start assembly by pining down the TE over the plans. Use the straight ribs to locate the LE and bottom main spar. The plans call for 1/16 x 3/32 balsa for the three stabilizer spars. I couldn’t find that size at the local hobby shop, but it only took a few minutes to strip from 1/16-inch sheet. I glued the straight ribs in place then added the vertical-grain webbing on top of the main spar. Next I added the upper main spar and the front spar. The diagonal ribs required beveling at the front and rear to fit against the main spar and TE. After the glue dried, I removed the stabilizer from the plans and added 1/16 sheet tips doublers, then sanded the LE and TE to shape. Uncovered, my stabilizer weighed 4.0 grams. Don suggested that I add 1.0 x 0.1 mm carbon-fiber caps to the top and bottom of the diagonal ribs; this produced a significant increase in torsional strength, with a weight gain of only 0.4 grams. To keep the tail light, I covered the stabilizer with RA MicroLite, a lightweight Mylar covering available in a wide range of colors from Homefly. As shown on the plans I added a 1/32 plywood disc to the TE and drilled a hole for the DT line and drilled and tapped a 2-56 thread for the nylon adjustment screw. At Dan Berry’s suggestion, I installed the screw with the head on the bottom to provide more bearing area where it contacts the fuselage. The 9% flat-bottom airfoil has a slight amount of Philips entry (upswept LE) and two upper spars at 9% and 18% reduce covering sag and provide some turbulation. My one deviation from the plans was in the wing construction. As drawn, each outboard dihedral break uses a single rib shared by the two panels. 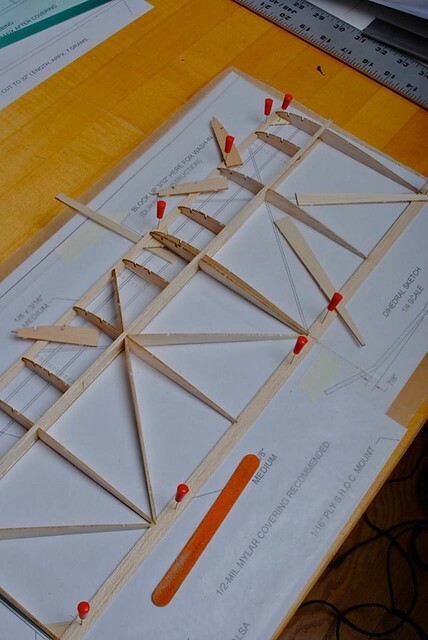 Although this saves a gram or so of weight, I’ve always thought it makes construction a bit more trouble, since the two adjacent panels have to be partially built, and then joined at the correct dihedral angle before the break rib and upper spars are added. I prefer to use two ribs at the dihedral joint, tilted to half the angle between panels. This is the same double-rib joint used in the wing center break. It only took a few minutes to cut two extra ribs from scrap 1/16-inch sheet. Either method would work well; I wanted to use the more familiar method. The plans call for 1/8 x 3/8-inch balsa for the TE. I planed and sanded the rectangular balsa to match the slope and height of the ribs, which is roughly 3/32 inch. As it turned out, I could have used 3/32-thick stock for the TE instead of 1/8 and saved myself some sanding. The thinner TE has remained straight after covering. Wing construction is similar to stabilizer construction. The straight ribs were installed first then the webbing and upper main spars were added. Next the front and rear diagonal ribs as well as the straight half-ribs were added. I made sure to block up the right main panel LE at the dihedral break for washin. This must be built in during construction. Dan Berry added roughly 1/16-inch washout in both wing tips to reduce the possibility of tip stall on his 202-E. When I installed the front spars, I found it easier to sand the four panels separately before joining. 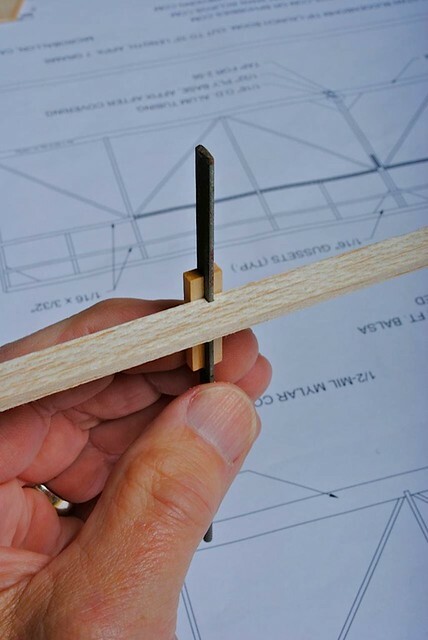 Use the notching tool to notch the break ribs just in front of the main spar for the 1/16-inch plywood dihedral braces. Finished but uncovered, the wing weighed slightly more than 21 grams. Don DeLoach also suggested adding carbon-fiber caps to the wing diagonal ribs, especially if Mylar film covering is used. Because I planned to use Airspan polyester tissue for the wing, I omitted the optional carbon caps. Finished weight for the wing was 31.1 grams. This was easy! 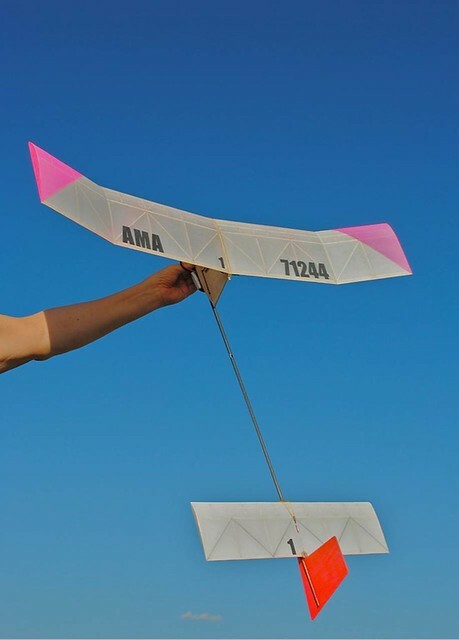 The tapered carbon-fiber kite spar, popular for tip-launch glider booms, provides a ready-made fuselage that is light, straight, and strong enough to prevent those embarrassing fuselage breaks behind the pylon or in front of the stabilizer. Construction consists of making and attaching the vertical stabilizer, stabilizer mount, pylon, and motor mount to the kite spar. The only hard part is getting everything on straight. I started with the vertical stabilizer. It is glued up from light C-grain balsa with reinforcements top and bottom. Note that the vertical stabilizer is one piece, the sub-fin is not separate. I sanded it to a symmetrical airfoil shape, but waited to cut out the rudder tab. I sanded the entire carbon-fiber boom to remove the clear plastic coating; this is necessary for good adhesion and also removes some weight. Then I cut a slot to fit over the boom, being careful not to force anything because the vertical stabilizer is fragile at this stage. To attach the vertical stabilizer to the boom, I first shimmed up the tapered boom so the centerline was parallel with the workbench. Then I shimmed up the vertical stabilizer so it was centered on the boom and parallel to the bench top. I then glued it in place with CA. I jigged up the fuselage with the vertical stabilizer vertical then used an electronic angle finder to set the desired angle for the stabilizer mount. I used a tiny amount of epoxy for this joint; after the epoxy set, I added fillets of an epoxy/micro-balloon mix to reinforce the joint. A small, 1/32-inch plywood pad attaches to the top of the boom in front of the vertical stabilizer. A 1/16-inch aluminum tubing DT line guide runs through the plywood, into the boom, and curves forward to exit the boom on the left side of the sub-fin. The easiest way make holes in carbon-fiber booms is to use the tip of a sharp number 11 blade to start the hole, opening the hole slightly by rotating the blade, then enlarging with a drill bit in a pin vise. The motor mount consists of two laser-cut plywood discs. One has an L-shaped slot for the 0.047 inch wire landing skid. Solid balsa reinforcement strengthens the motor mount to boom joint. I cut a 1 x 1 x 1-3/8-inch block and squared up the front and marked the center. Then I angled the rear of the block 3° with a sanding block, resulting in a short, square Leaning Tower of Pisa. After marking the top of the block, I tack-glued the solid plywood disc to the front as a guide while carving and sanding the balsa block to shape. Then I popped off the disc. I glued the two discs together and epoxied the wire skid in place. I glued this to the block, making sure that the skid pointed straight down relative to the top mark on the block. I sanded an inch-long piece of 1/4-inch dowel to fit inside the front of the boom and epoxied it in place flush with the end, then epoxied the motor mount assembly to the boom, making sure that the skid and rudder were vertical. 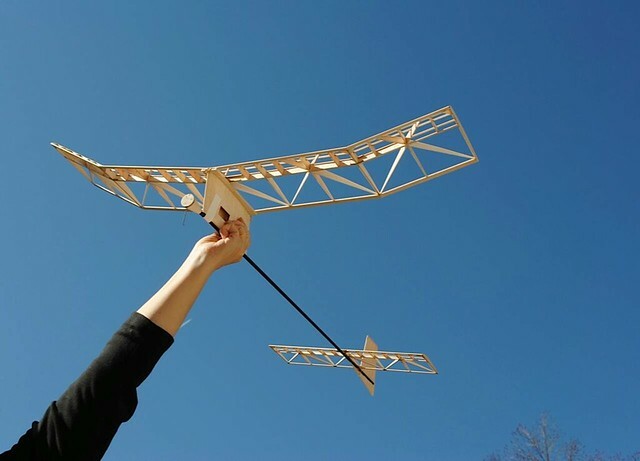 The pylon is a simple sheet-balsa affair consisting of laser-cut balsa formers top and bottom, with 1/16-inch balsa sides that you supply. It is important to make sure the top and bottom formers are glued up square and parallel. Notice that the pylon sides extend below the bottom of the lower former 3/32 inch. I waited until the timer I had ordered was in hand before attaching the left side. This made fitting the interior plywood timer mount easier. After the pylon was glued up, I attached sandpaper to a piece of 1/4-inch dowel and sanded the bottom of the pylon to fit the boom. I covered the pylon with Polyspan with the grain running fore and aft; light glass would have strengthened the pylon as well. 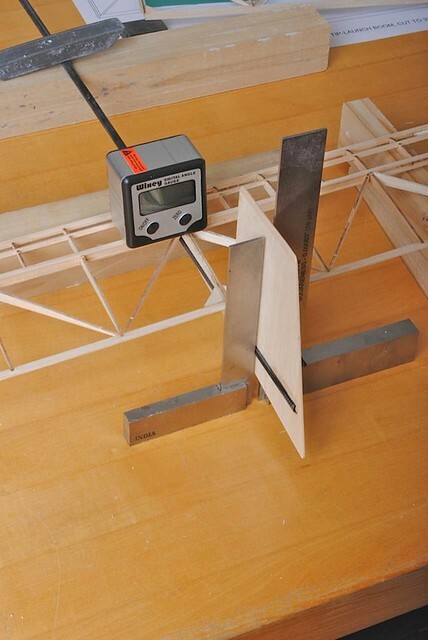 The wing mount is 3/32-balsa with strip balsa runners on either side to accommodate the wing’s dihedral. Fuselage weight was slightly less than 20 grams before finishing the rudder with two coats of Deft and a light spray of fluorescent paint. With any type of FF model, the most important step is making sure that all components are accurately aligned, the CG is correct, and that all systems work perfectly. I began by installing the motor and propeller, fitting the ESC, timer, and servo in the pylon. I temporarily taped the pylon and battery in place and attached wing and stabilizer. By moving the pylon and battery back and forth along the fuselage, I was able to get the CG exactly as shown on the plans. Then I epoxied the pylon to the fuselage, making sure the pylon and vertical stabilizer were aligned. Setting the pylon upside down made this easy. Next I strapped the wing in place and checked alignment by measuring from the rear of the fuselage to both wingtips, making adjustments until both measurements were equal. On Dan Berry’s recommendation, I added 1/16 x 1/4-inch basswood keys to the underside of the LE and TR tight against the wing mount. The keys will ensure that the wing is on straight each flight. The tightly-stretched wing hold-down rubber bands slightly pulled the TE down. I fixed this by adding 3/32-inch thick balsa strips to the top of the wing saddle in the front and rear. I sanded them to match the underside center of the wing, giving full support. At the back end, I cut out the rudder tab, and then attached it with two pieces of copper wire to allow adjustment. The 14-gauge wire I used was too thick to adjust easily and impossible to remove without breaking the tab. After patching the vertical stabilizer, I cut a piece of 1/16-inch balsa the same size as the tab, sanded it to a wedge shape, and glued it to the right rear of the vertical stabilizer. Movable rudder tabs are too easily knocked out of position and too tempting to tweak. For DT, I added a wire and brass tube lever on the side of the pylon behind the timer. The long arm runs forward, where it is trapped underneath the servo lever. The other end holds a rubber band attached to the front end of the monofilament DT line that runs back to the stabilizer. I practiced setting the timer, checking motor run and DT times, and ensuring that everything worked. If you have experience flying a gas model, the process of testing and flying the Super Pearl E-202 will be familiar. As with any locked-up, pylon-type power model (gas or electric), adjusting the model to fly safely and to its maximum potential involves carefully balancing controls so it flies itself, free of any control from the ground. Some adjustments, such as side- or downthrust, CG location, and stabilizer tilt, are more effective at low speed and become less effective at higher speeds. Rudder offset, wing wash, and decalage are more effective at high speeds and less effective at low speeds. On the Super Pearl 202-E, the left thrust offset helps prevent the model from hooking to the right on launch. Once airspeed builds, the right rudder tab produces right turn in the climb, while the washin on the right main wing panel produces the left roll needed to balance the right turn, giving the desired corkscrew climb. Decalage controls the climb angle. Too much decalage and the model will loop; too little and the climb will be flat. For a model without an auto stabilizer, such as the 202-E, the climb angle must be optimized by changing the decalage. This is easy on this model thanks to the adjustment screw on the stabilizer. Short motor run flights with the DT set a few seconds after the motor stops allow climb adjustments to be made safely. Gradually lengthen the motor runs with repeated test flights, until the climb and recovery are right, then the glide can be optimized. In the glide, the right stabilizer tilt becomes more effective and is used to adjust the diameter of the glide circle. Slight CG adjustments are used to fine-tune the glide angle. The external battery makes this easy, but be sure to mark the final location on the fuselage. Hand gliding my Super Pearl 202-E showed it needed more stabilizer tilt than I had built in. It ended up with a 3/64-inch shim on the right side of the stabilizer mount to get a reasonably amount of glide turn. Because increasing the stabilizer tilt raised the stabilizer’s LE effectively decreasing decalage, I had to raise the stabilizer’s TE by half the amount of the shim thickness. Instead of gluing in a shim that would leave the stabilizer’s center unsupported, I added a basswood wedge the full width of stabilizer mount. The purpose of hand gliding a locked-up power model is not to get the glide perfect, but to make sure that the glide is safe enough to begin power testing. The model should have a definite right glide turn without a hint of a stall or dive. Power testing my 202-E was delayed because of weather and the lack of a nearby flying site; however, Dan Berry and Randy Reynolds offered their trimming experiences. “In the desert I removed the prop for glide tests; with the CG as drawn I got it gliding,” said Dan. For the first power flight, he set the motor run for five seconds, started the timer and counted two seconds before launching. “It went up and right safely. For the second flight I moved the battery back and lowered the stab. Steeper climb with less right turn was the result. I lowered the stab some more, moved the battery further back and flew again—nice steep pattern that wanted a bit of right tab. I added some right tab and that’s what it has now. It’s a Pearl. It shouldn’t need a lot of trim flights if warps are reasonable and it gets assembled sort of square,” said Berry. The Super Pearl 202-E provides a FF modeler with some building experience with this easy-to-build electric-powered aircraft. The modified Union Jack construction, coupled with the 9% thick airfoil, produces a stiff wing that should withstand the rigors of flying. Using a tapered carbon-fiber tube made fuselage construction faster, and probably lighter, than that of a conventional balsa box. The builder must supply strip wood, sheet balsa, hardware, and, in this case, the carbon-fiber boom. I had most of the balsa on hand and only needed to pick up a few pieces of strip wood at the local hobby shop. The laser-cut ribs and other parts were provided. Although the model went together in a few days, the process of tracking down, ordering, and receiving some of the electronic gear took several weeks. If something is out of stock, the wait can be even longer, so it pays to plan ahead. If you are new to electric, allow yourself time to become familiar with setting and operating the timer and charging the battery. The Super Pearl 202-E kit is popular, so there is a growing body of information on building and flying this design available on the Internet. The E-36 event is becoming increasingly popular, offering the fast climb of gas without the mess and the challenge of rubber, and without the large amount of ground support equipment. Motor: You could use any of the hundreds of small electric motors coming out of China, but the most popular choice is a brushless outrunner motor. The electromagnets in brushless motors are stationary; instead of graphite brushes, solid-state electronics handle the polarity-switching that turns the motor. The rotor of an outrunner motor is on the outside which gives increased torque, effectively acting like a geared in-runner without the cost, complexity, and weight of gears. A typical E-36 motor is roughly 7/8 inch in diameter and approximately an inch long, not counting the propeller shaft. Weight including wiring and radial mount is roughly 25 grams. For the Super Pearl 202-E, Don DeLoach recommends the AX 1806N-2500 Kv, available from Texas Timers or Hobby King. Propeller: For reduced drag in the glide, many E-36 fliers use a folding propeller designed for electric models. The recommended propeller setup consists of the Graupner 7.5 x 4 carbon-fiber blades and machined aluminum hub, both available from Texas Timers. A non-folding propeller designed for electrics can also be used. ESC: The electronic speed controller provides the electronic interface between the motor and battery. The ESC controls motor speed and can provide dynamic breaking at shutoff. Many include a low-voltage sensor that shuts off power to the motor if it detects low voltage. This is intended as a safety feature for RC electric models, but can be a problem for FF electrics because of the voltage drop caused by high current draw at startup. 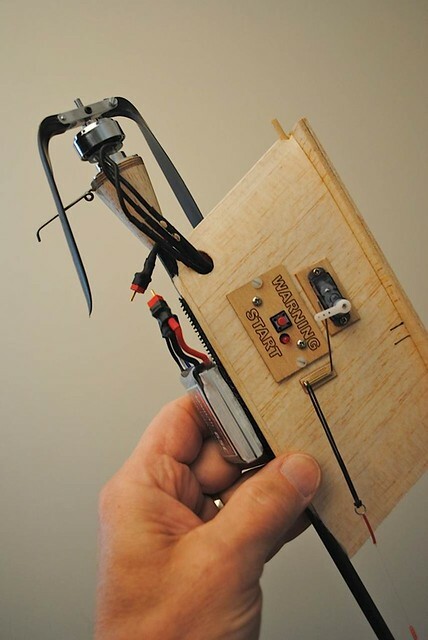 ESCs can be reprogrammed using an RC transmitter and receiver or with an inexpensive program card. At least one domestic motor and ESC supplier, Hank Nystrum at Texas Timers, can program an ESC for FF use at time of purchase for a small fee. Timer: Turning on and cutting off a brushless motor is not as easy as flipping a switch. For motor start and stop, the timer needs to send the correct electronic signal to the ESC, which then tells the motor what to do. The two most popular E-36 timers are the StarLink FliteTech E-Timer and the Micro-E from Texas Timers. The StarLink E-Timer controls the motor run and DT time electronically using a preprogrammed chip. It comes with a laser-cut plywood mounting plate and plugs into the ESC and servo. The Texas Timers Micro-E uses a mechanical, spring-powered scroll to control motor run. This triggers a circuit board that signals the ESC. Two versions are available. One controls only motor run, and requires a separate DT timer; the other incorporates an electronic DT timer. Servo: Yes, you need a servo for a FF model. If you use either the E-Timer or the Micro-E timer with electronic DT, a servo is required to release the hold-down line back to the stabilizer for DT. Any inexpensive, lightweight submicro servo should do, since it only has to move once per flight. Battery: Although nickel-based cells are permitted by the event rules, nearly everyone has opted for the lighter and more powerful LiPo cells. The recommended battery is the Thunder Power G6 325 mAh, 7.4-volt (2S) 65C, available from RC Lipos or from Texas Timers. You will also need a battery charger and balancer designed for LiPo batteries, available at local hobby shops or from Texas Timers. Be sure get a charger that can be used with 12-volt DC to allow field recharging. Most importantly, read all safety warnings about battery handling and charging. • Well-thought-out wing and tail construction. • Carbon-fiber fuselage is light and durable. • Accurate full-size plans and laser-cut parts. • Short kit reduces shipping cost and allows builder to select strip and sheet wood. • No step-by-step building or trimming instructions. • Short kit requires builder to supply strip and sheet wood as well as hardware. • Stabilizer mount could be wider.